Boston, Massachusetts – February 2019: MASE’s Tareq Khalifeh will be among a group of established energy entrepreneurs and professionals at the Harvard Business School Asia Business Conference 2019. The Conference will be held at the Harvard Business School campus on Sunday March 3, 2019. Khalifeh will join the Energy Panel to explore the current situation of energy markets across the region. The Panel will also discuss the efforts of individual countries and regional efforts and address the actions needed to adequately prepare the region for future challenges. As the only Arab panel member, Khalifeh will focus on presenting energy models in the Middle East and Gulf, challenges facing power and energy markets and innovative measures being implemented to address contemporary energy market challenges across the region. Since 1994, the student-run Asia Business Conference at Harvard Business School has hosted dynamic discussions on Asia by thought leaders in a range of disciplines and fields. Today, it is the largest student-run conference on Asia in North America, drawing hundreds of attendees from not only the Harvard and greater Boston community, but also from all over the world. This year’s conference will take place on Sunday, March 3rd 2019 at Harvard Business School under the theme “The Game Changers: Consumers. Shapers. Innovators.”, recognizing that Asia is increasingly influencing the world’s trends in multiple sectors. Amman, Jordan – July 2018: The MASE Summer Internship Program has filled up! Three bright and ambitious college students join our team for up to three months and experience first-hand designing, building, operating and maintaining retail and utility-scale solar PV plants. Thank you to all 20+ students who submitted applications. Amman, Jordan – May 2017: MASE is pleased to announce that it has participated in the Ahliyyah School for Girls (CMS) and Bishop’s School for Boys (Bishop’s School) 2017 Careers Day which took place on CMS premises on Saturday 06 May 2017 and saw the participation of students from both the CMS and Bishop’s schools as well as examples of Jordan’s leading companies. 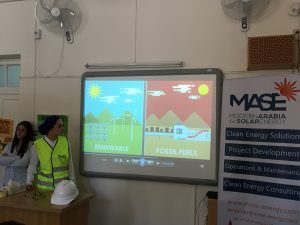 The 45-minute MASE workshop was carried out by Project Coordinator Sonia Al Zoghoul and was aimed at preparing high-school students for careers in renewable energy. The session provided the students with real-world examples from a career in solar energy, project implementation, project management as well as an account of Sonia’s own experience with MASE and careers in the renewable energy field in general. The session also provided CMS and Bishop’s School students with the tools they need to prepare for an education in renewable energy as well as career tips to establish their long-term goals. MASE looks forward to continued participation in career events organized by CMS and is currently considering several CMS and Bishop’s School candidates for its MASE Summer Internship Program 2017 intake. The MASE Summer Internship Program is a three-month intensive training program aimed at high-school and university students with interest in renewable energy and with a focus on solar. The Program is designed to compliment classroom education by providing participants with a comprehensive on-the-job experience within an award-winning corporate environment. The competitive Program and has attracted participation from local Jordanian, regional and international schools and universities including the Hashemite University, University of Jordan, German Jordanian University, Purdue University, Northeastern University, Georgia Tech, Imperial College of London, Coventry University and others. Applications are submitted through the MASE Career’s Page.